I've read some of the other books E.J. Copperman has written as Jeff Cohen and Copperman. I was a big fan of his Comedy Tonight series. I read many of the Haunted Guesthouse books, and both Mysterious Detective stories. But, I love Kay Powell, the "agent to the paws" in Dog Dish of Doom, and now, an even more entertaining mystery, Bird, Bath, and Beyond. Kay Powell quit the family show business gig to go to college. She went to law school, and, in some ways, returned to the family business by becoming a talent agent who handled animal clients. She usually doesn't accompany her clients to their jobs, but Barney, the parrot, needed a handler one day. His owner, Patty Basilico, is laid up, and sounded so sick, Kay agreed to take him to the set of Dead City, a television show. Barney's replacing a parrot who died, and Patty already taught him his lines. When he's needed again after the break, the director lets Kay leave Barney in Dray Mattone's trailer. Kay's only gone for an hour, but, in that time, someone shoots Mattone. When she finally has the chance to claim Barney, the investigating detectives are already convinced Barney, the only witness, can tell them who killed the star. Despite Kay's insistence that Barney can't tell them anything because he can only repeat what he's been taught, everyone from the police officers to the media believes Barney will point them to the killer. For Kay, every day is a juggling act. While the murder investigation is going on, she lets her capable office manager, Consuelo, handle some of the business. But, she still has to deal with her parents, performers who return to Kay's home after a rough gig on a cruise ship. Her loving parents, always a team, suddenly have opposing views as to what they want to do with their future. And, of course, Kay's caught up in assisting the police, and then a criminal attorney after an arrest is made. At times, Kay appears to be a mature adult caught in a world of star-struck entertainers. I love these books and Kay Powell. Yes, I know she's a fictional character, but she loves her parents, animals, show business, and her friends. She's a character who speaks directly to the reader, and her her comments are either funny, or she keeps her witty comments between herself and the reader so as to not offend people. And, as much as possible for an amateur sleuth, she works with the police. She doesn't work against them. Looking for humor, a likable amateur sleuth and a delightful mystery? Check out Bird, Bath, and Beyond. 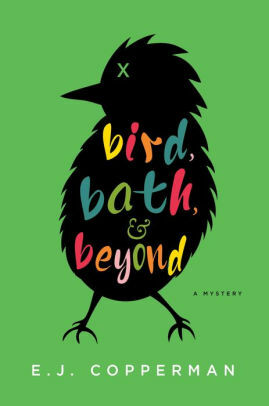 Bird, Bath, and Beyond by E.J. Copperman. Minotaur Books, 2018. ISBN 9781250084293 (hardcover), 304p. FTC Full Disclosure - I received the book to review for a journal. Oh, this sounds like such a fun read! I love mysteries with humorous situations, and this sounds truly funny as well as fun. It really is, Elizabeth. Copperman's books are fun, and funny. This one is on my library list. I hope you enjoy it, Gram. This sounded so good, I bought the first in the series!